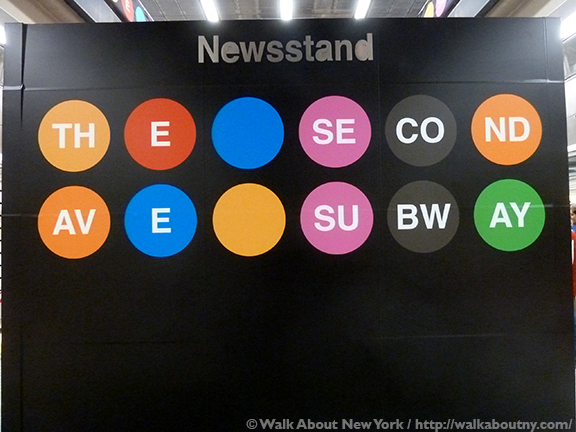 Circles identify the subway lines every day, and announced the new one too. Vintage images at one station take riders back in time. The artist’s friends and family gaze out at passers-by from their portraits. This detail of the artwork is included in our favorite art installation. 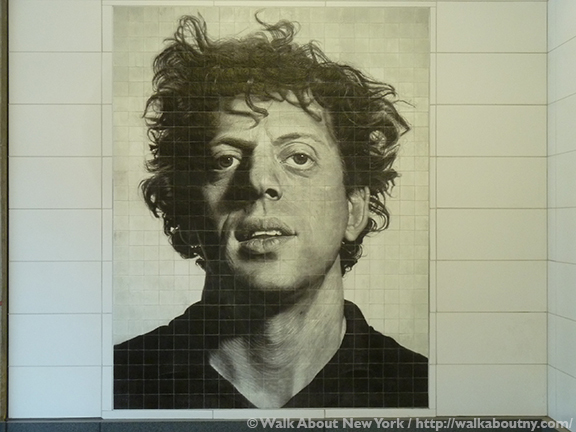 A youthful Philip Glass greets passengers as they descend into a station. Birds in a landscape flutter across the walls at one station. 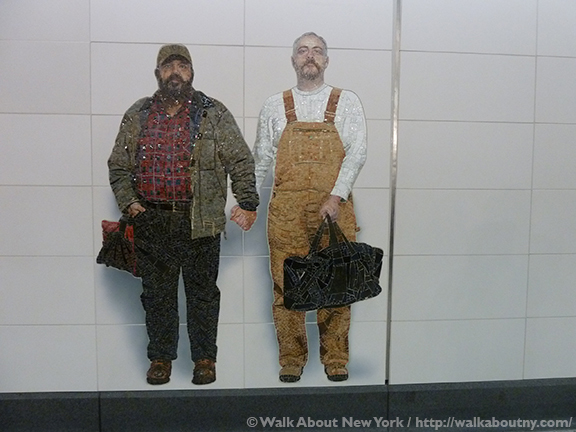 Two hand-holding men are among the images at our favorite installation. With the Second Avenue subway the MTA Arts & Design public arts program had its most unique opportunity since its founding in the 1980s. This was a chance to design three subway stations from below the ground up! 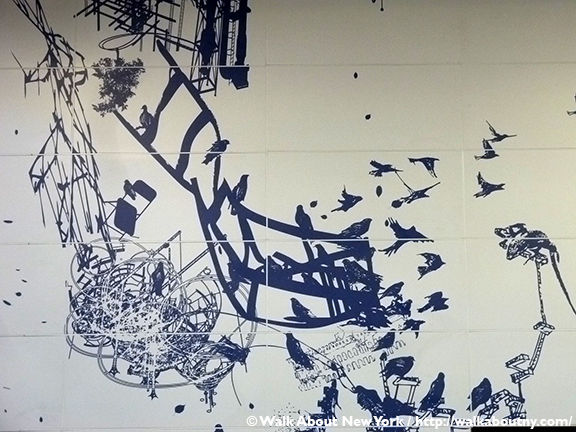 Part of that $4.5-billion project was commissioning four artists to create artworks that would enliven the new or renovated stations along the extended Q line. 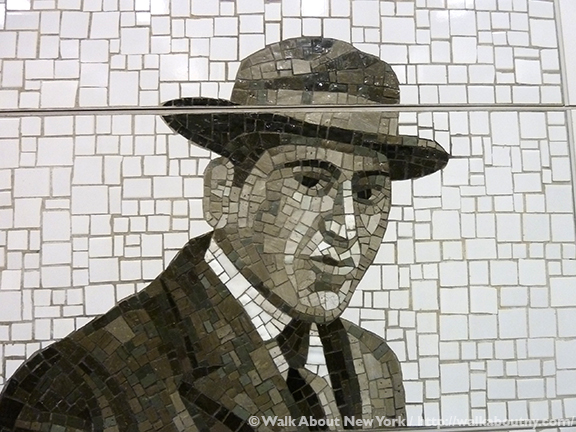 On this Tour you will discover the possible reason why traditional subway tiles are not used at these new stations; and how the artists’ mosaic designs are integrated into the walls of stations throughout the system. Some artists have included self-portraits; one is obvious; the other is not. The depiction of two men holding hands in a non-political way is truly ground breaking. Three stations display the mottoes of two political areas. Which ones? Take the Tour; Know More! 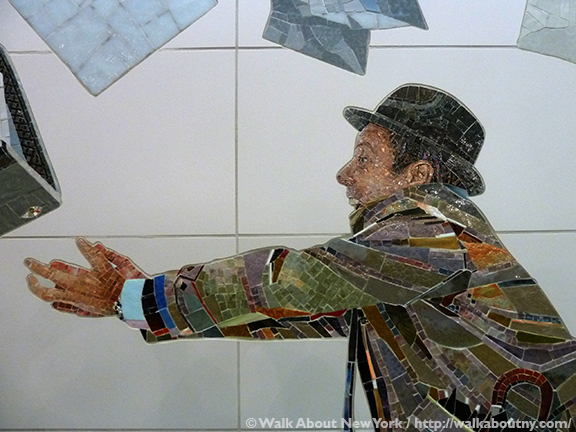 The Metropolitan Transportation Authority (MTA) owns one of the most extensive public art collection in the country, if not the world. The grander projects are within the stations. Within the subways cars there are smaller examples of the MTA Arts and Design’s program. In addition to amusing and entertaining illustrations in the train cars a project called Poetry in Motion give straphangers something to engage their thoughts. For the Shuttle trains between Times Square and Grand Central Terminal, the cars themselves become a canvas, albeit for advertising; nonetheless, the result is impressive. 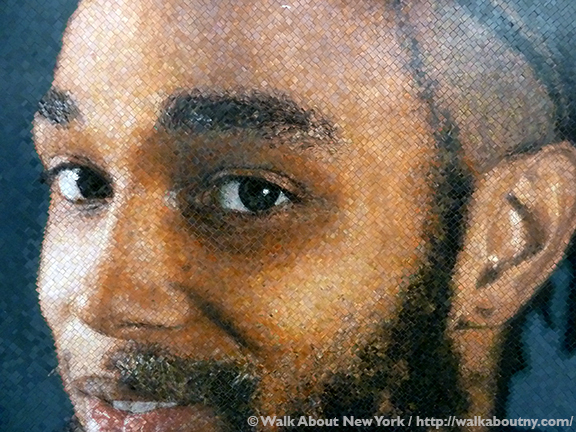 The art is not limited to the walls of the subway stations and passageways. If we are lucky we will see performance art too. Musicians and puppeteers use the subway stations to entertain riders moving from one subway line to another line, and as a greeting to riders when they enter through the turnstiles. Other musicians use the subway platforms as a stage; and some even put on a show in the subway cars. These performers are seeking donations. The level of your generosity is up to you. The Tour’s cost is $30 for adults, $20 for seniors 65 years and older, and $15 for youths 13 to 18 years of age. Please consult the Calendar Schedule for the dates and times of the Tour. Click on the “Book Now” button at the top of the page or below to book your place. The Tour runs 2 hours. Bookings must be made at least 36 hours before the Tour begins. Tours are conducted in English. All Tour participants assume normal liability for their behavior during the Tour. With only one swipe of your MetroCard you gain access to a fascinating art museum at the core of the Big Apple. We gather at the subway entrance on the SW corner of Second Avenue and East 94th Street. The Tour ends at East 63rd Street and Lexington Avenue, where there is art to see! Wear comfortable shoes. Although we ride the trains from station to station, there are numerous flights of steps to ascend and descend along the route; and we walk the length of many subway platforms. You will get a good workout on this Tour! Travel light! Carrying too many bags will interfere with your enjoyment of the Tour.